Shane Valenti has capped off a fantastic debut season at Port Melbourne by taking out the competition best and fairest award, the JJ Liston Trophy. Valenti shared the award with North Ballarat rover, Steve Clifton with both finishing on 20 votes. After a slow start to season 2010, Shane polled all his votes in the second half of the year which included six best on ground performances. His great season was also highlighted by being named in the VFL team of the year for season 2010. He was joined in this side by fellow Port Melbourne players Sam Plemming, Callum Sinclair and Toby Pinwill. Shane now has his name amongst some of the greatest footballers to play in the VFA/VFL. He has also achieved something unique in that he becomes the first footballer to achieve the Fothergill/Round and Liston Trophy double. 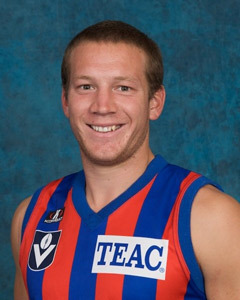 Valenti won the Fothergill/Round Medal in season 2007 before spending 2 seasons for 15 games at the Melbourne Football Club. He is Port Melbourne’s first winner since rover Steven Oscar Harkins won the award in 1990 when he was involved in a four way tie. Although Jeremy Clayton did poll the most votes in 2005 while playing for Port, he was ineligible to win due to suspension. Port Melbourne has a proud history of producing Liston Trophy winners with some great Borough names such as Aanensen, Swan, Allender and Harkins all winning the award in seasons gone by. Congratulations to Shane Valenti on a season of excellence in 2010.